During North Carolina's antebellum period, the construction of railroads made building materials more accessible, boosted the economy, and supported the development of factories to mass-produce lumber and other construction components. In leading towns and progressive rural areas, North Carolinians adopted the nationally popular Greek Revival, Gothic Revival, and Italianate styles. Reflecting the development of the architectural profession, key buildings were designed by architects. Prime landmarks of the era are the State Capitol (1833-40) and Christ Episcopal Church (1848-52) in Raleigh. Elaborate Greek Revival and Italianate plantation houses and town houses, such as Coolmore near Tarboro, were built for corn, cotton, and tobacco planters along the rivers and railroads. Farther west, completion of the Buncombe Turnpike from South Carolina to Henderson and Buncombe Counties encouraged construction of houses and churches in Gothic Revival, Italianate, and Greek Revival modes. The Civil War and its aftermath brought a hiatus in construction. As the state's economy and transportation system recovered, the Industrial Revolution transformed the building industry. Mass production of all construction elements, made possible by the development of rail networks and large-scale steam-powered factories, meant that bricks, framing timbers, finishing and decorative elements, nails, glass, and every other component were produced at speeds and low costs unimaginable earlier in the nineteenth century. A troubled agricultural economy and the shift from a slave to a tenant system of labor kept most rural building simple and unpretentious, but thousands of modest frame farmhouses, barns, sheds, and other structures were built with factory-produced lumber, nails, bricks, and hardware. Like the small houses built for workers moving into growing towns to find jobs, most of these buildings continued along earlier forms and plans, even as they incorporated new construction methods. With the development of flue-cured bright leaf tobacco culture, a distinctive building form appeared on the landscape: the flue-cure tobacco barn. These small, tightly built structures allowed farmers to cure tobacco with carefully regulated heating stages. Such barns appeared first in the Old Belt in the northern Piedmont, then grew numerous eastward as tobacco culture began to replace cotton in the Coastal Plain in the late nineteenth and early twentieth centuries. Monuments of the Industrial Revolution appeared in textile mills and other factories. Mill architecture combined practical concerns of function and fire resistance with popular stylistic devices adapted from the Italianate style-low-pitched roofs, arched windows, campanile-like towers, and ornate brickwork. Textile industrialists also built residential villages of regularly placed one- or two-story dwellings near the mill to house employees. The picturesque Italianate and Gothic Revival styles continued their popularity, joined by the nationally popular Second Empire style with its distinguishing mansard roof and, later, the eclectic Queen Anne style. For key public building projects, the state engaged Philadelphia architect Samuel Sloan. Sloan designed the Western North Carolina Hospital for the Insane (later Broughton Hospital) at Morganton in the elaborate, dramatic Queen Anne style, as well as the ornate, brick Executive Mansion in Raleigh. The design of the era appears at its most magnificent at Biltmore near Asheville. Built in the 1890s for industrial heir George Washington Vanderbilt, the immense house was designed in a French château style by leading American architect Richard Morris Hunt, while the estate was planned by Frederick Law Olmsted, the great American landscape architect. John V. Allcott, Colonial Homes in North Carolina (repr., 1975). Catherine W. Bishir, North Carolina Architecture (1990). Bishir and others, Architects and Builders in North Carolina: A History of the Practice of Building (1990). Bishir and Michael T. Southern, A Guide to the Historic Architecture of Eastern North Carolina (1996). Frances Benjamin Johnston and Thomas T. Waterman, The Early Architecture of North Carolina (1941). Mills Lane, Architecture of the Old South: North Carolina (1985). Bishir, Catherine W. 2005. North Carolina architecture. Chapel Hill, N.C.: University of North Carolina Press. Bishir, Catherine W., Michael T. Southern, and Jennifer F. Martin. 1999. A guide to the historic architecture of western North Carolina. Chapel Hill: University of North Carolina Press. Built Heritage of North Carolina: Historic Architecture in the Old North State, http://www.lib.ncsu.edu/specialcollections/builtheritage/. North Carolina Architects and Builders, http://ncarchitects.lib.ncsu.edu/. North Carolina State Historic Preservation Office, http://www.hpo.ncdcr.gov/. Bibliography at http://www.hpo.ncdcr.gov/bibliog.htm. Learn NC resources on architecture. Resources in libraries [via WorldCat]. NC LIVE search results on architecture and North Carolina. 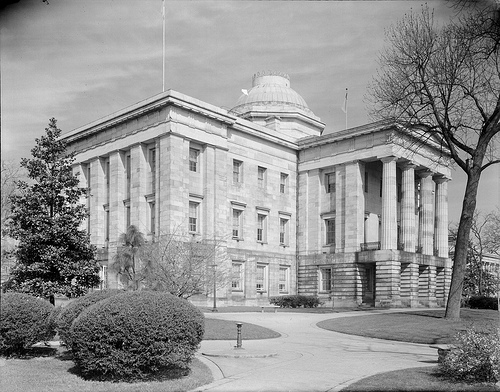 NC State Capitol, Raleigh, NC, from the southeast, early 1940s. From the Albert Barden Collection, North Carolina State Archives, call #: N.53.15.558. Available from http://www.flickr.com/photos/north-carolina-state-archives/2431089363/ (accessed September 24, 2012). 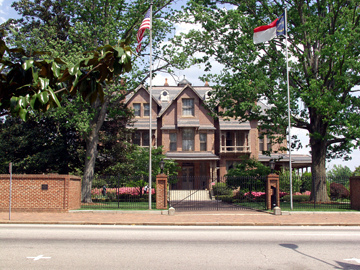 North Carolina Executive Mansion, 23 April 2004. From General Negative Collection, North Carolina State Archives, call #: D.2006.11.121, Raleigh, NC. Available from http://www.flickr.com/photos/north-carolina-state-archives/6100676475/ (accessed September 24, 2012). 1 January 2006 | Bishir, Catherine W.